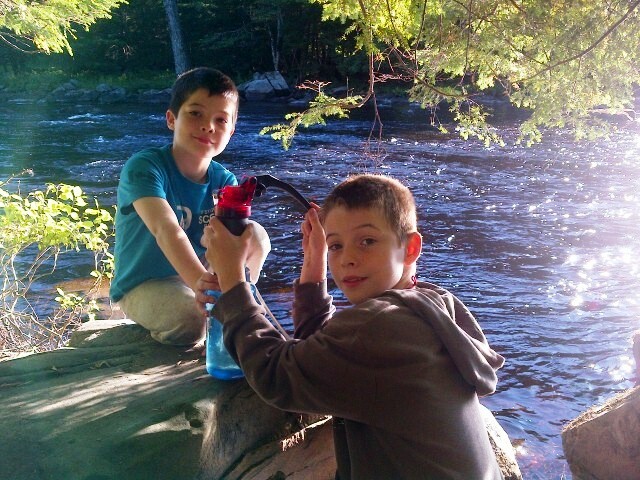 My boys are away on their annual camping trip to Kejimkujik (while I’m stuck at work). But this year it is with a twist. Yesterday, The Husband left the comforts of car camping and took the boys on a backcountry adventure. They are strapping their gear to their backs, portaging with the canoe, and venturing out to camp on a remote island site. This is very exciting for us as parents because this is the way we always camped before we had the boys. We would hike or canoe for hours to get to a site. There is just something magical about being out in the woods with no one else around; no light to dim the stars and no noise to drown out the loons. Fingers crossed that the boys love the experience as much as we do so that this can be something we continue to do as a family. Although, as long as they still get to roast marshmallows, I’m sure they’ll be happy. Do you have a passion that you hope to pass on to your children? My three boys have just driven away to go camping in Keji. I couldn’t go due to work commitments. Kejimkujik National Park is where I grew up camping with my family and where The Husband and I developed our backcountry skills. We fell in love with long hikes and heavy packs and took on much bigger challenges.